In this particular blog we will discuss a very important feature of Spring i.e. IoC in spring or Spring Dependency Injection. Spring IoC so called spring inversion of control is a technique that is used to implement dependency injection in Spring. Dependency Injection or simply Spring DI is a Software Design Pattern that removes hard coded dependencies and make it possible to change them at Compile time or Run Time. IoC Container implements this Dependency Injection design pattern in Spring framework. org.springframework.beans and org.springframework.context are two packages that contains basic functionality of Spring?s IoC. The BeanFactory interface provides an advanced high level configuration mechanism capable of managing any type of objects. BeanFactory provides configuration level basic functionality for IoC implementation. ApplicationContext is a sub-interface that is built on BeanFactory, it provides application level context to be used in Spring web applications. ApplicationContext is a complete super-set of BeanFactory and any functionality provided by BeanFactory is also available in ApplicationContext. A number of the developers seems to be confused in between the usage of these two Interfaces. BeanFactory interface is the core IoC interface of Spring, it just instantiate and configures the beans. ApplicationContext on the other hand is build on BeanFactory interface so it does everything as BeanFactory and some extra industry-centric functionalities as well. So ApplicationContext is a better choice in most of the situations. Spring IoC container consumes some sort of configuration mostly in the form of XML, this configuration tells the container a way in which the objects are to be instantiated, configured and managed in the application. Spring configuration contains at least one bean definition that the container must manage. These beans are declared under <bean>..</bean> tags and all beans resides under <beans>..</beans> tags. A bean is simply a Java object that is instantiated, configured and assembled in application by IoC container, there is nothing more than that about the beans we are talking here. Every real time Java Application have at least a handful of objects, these objects communicates with each other throughout the application. These objects have dependencies on each other, the role of IoC is actually to inject those dependencies. To know more about setter injection in spring Click Here. To know more about constructor injection in spring Click Here. In this particular blog we come across a quick introduction to spring dependency injection. 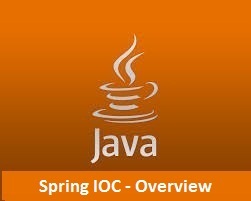 We also knows a little about Spring IOC and its implementation using setter method and constructor method. In upcoming blogs we will see Spring DI via Setter Method and Sprng DI via Constructor methods in details.